People have debated the merits of using a lid on their grills as long as grills have been around. 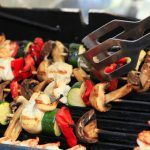 While it is true that the earliest BBQ grills were used primarily to grill steaks and burgers, grilling connoisseurs over the years have experimented with more and more food types. Today, people are just as likely to grill fruits and vegetables as they are to grill meats. They are also just as likely now to cook a thick roast on the grill as a few hot dogs. There’s no doubt about it, backyard grilling today is a sophisticated art form. Grilling with the lid open or shut has spawned at least as many arguments as which came first, the chicken or the egg? Experimentation with degree of doneness and flavor, along with basic science, has dictated the reasons why a lid should be closed while grilling. There are only a few things that compare to the joy of firing up a grill on a great summer day. Enjoying the company of family, friends, and food fresh from the pit has become a tradition for many people. One of the most important factors in cooking delicious barbeque is the type of grill you have. The options for outdoor grills are endless, ranging from cheap models to very expensive, high-tech models. There are a few things that should be considered when deciding on the right grill for cooking barbeque. The first thing you want to consider is the type of fuel you want to use in your grill. Grills use propane, natural gas, electricity, charcoal, or wood pellet fuel. Different types of fuel produce different results and distinct flavors in the food that you cook. Charcoal grilling is said to yield the best flavors to your cooking, but they may not be the easiest to deal with. Another aspect to look at in grills that use fuel is a particular measurement called a BTU. Quality grills have a BTU value of 95 to 100. These grills can cook your food quickly and effectively.